The day before yesterday Ron and me went into a leisure park, the "Ruegenpark" to be exact. It is situated in Gingst upon Rugia, where I am spending my holidays right now (we are in a place called Ketelshagen near the town of Putbus). In this amusement park one could see a lot of miniature buildings, there were some great fun rides and we were really lucky with the weather, wich the first time here wasn´t rainy all day but even some sun peeked out. There was also a petting zoo, a very small one. A blackface sheep and a cozy black - and- white Jacob sheep shared the space together with a mama goat with her kid. The jacob sheep was extremely fluffy and cuddly and absolutely lanoline - free. I ask myself if they probably wash it? *g* The coat was long, slightly curly and very soft, like downy feathers. I have never seen and felt anything like this. This afternoon we went to Bergen (the biggest town here on this island) for buying a card reader to make it possible for me to blog with photos from my current holidays. Afterwards we went for a walk with our dog Yuki and used the Famila parking space and the surrounding area for this. Again it was raining all the time and he was sniffing here and there and took a lot of time for this. It was yesterday, that I recognized two sheep with black faces and legs and grey coat here, today there were even five of them. At the meadow between the parking space and the rails they enjoyed the good green gras. 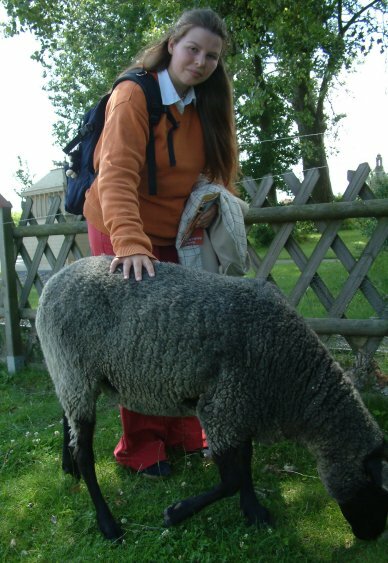 But then the quandary occured to me: the sheep were leashed on with a collar and a long thin leash. I was deadly sad and apalled. For me this is not what I would call a humane and adequate animal housing. Home in Brandenburg I´d immerdiately would have called the so called office vet and told him about this. What kind of humans must that be, that have the heart to do such a cruelty?